Not bad A good rum for mixing. Not alot of flavors upfront, but still good. Price wise, cheaper than Mount Gay or Appleton reserve so its a really good value. Good for mixers I like this rum for daiquiris and pina coladas. Pretty much the same as most better flavored rums. Old favorite Definitely been in my cabinet for years. Good for mixers. Its good, not great This is a good rum. I like the hints of orange and the smoothness. Its a very good choice for mixers, and I love the bottle. Good beach rum I keep a bottle around to accompany my Mount Gay Eclipse. 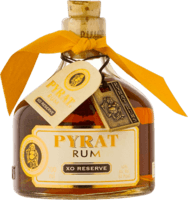 Pretty basic rum with good flavor and great price. always in my bar This rum has a nice taste and mixes great with any fruit juices. Ok rum Its an OK rum, just not good or great. Has some nice notes, color is ok, but left me feeling a bit disappointed. Decent rum This was a decent rum. Good with a coke zero. Nothing special, but it didnt make me gag either. Good white rum I have a new favorite now, but Brugal Especial is still in my cabinet. Good with Mojitos and other citrus drinks. Standard flavored fair Not much to say about this rum, but its cheap and mixes with fruit juices well. Standard flavored fair This one is a bit harsh for me as far as flavored rums go. Definitely not on par with coconut, mango, or guava from Cruzan. Good mixer This another good mixer for a variety of party punches. It has a decent taste but very sweet, like most flavored rums. Very strong I didn't like this very much. It was really strong. Just dint suit my taste at all. Not a fan Just a well brand rum. better than some Bacardis but that doesnt say much. Oh so BAD nothing good too say. It was so strong and sweet that it wasnt drinkable to me. Cough syrup was a perfect discription.